Online Education Didn't Boost Colon Cancer Screening Much : Shots - Health News There is a strong consensus in favor of colon cancer screening. Educational efforts have fallen short when it comes to meeting public health goals. Why don't more people get tested? Kristen Miller, a colonoscopy patient, sits with Dr. Stephen Hanauer at the University of Chicago Medical Center in Chicago in 2010. They're looking at an interactive computer program describing benefits and risks of the procedure. Turn 50, and you can pretty much count on an invitation to join the AARP and a referral to the gastroenterologist to be screened for colon cancer. Two-thirds or less of people ages 50-75, the target range for colorectal cancer screening, are up-to-date on testing, according to the Centers of Disease Control and Prevention. That's better than it used to be, but still isn't up to par. The national screening goal is 70.5 percent of eligible people in 2020. So what's the best way to get more people to take action? 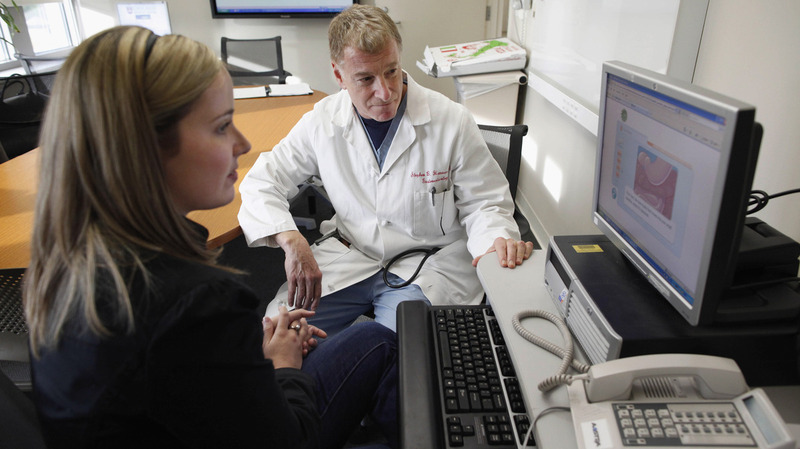 Researchers from the Fox Chase Cancer Center and Case Western tested Web-based educational materials to boost screening. The study, involving more than 900 women, found that the online approach wasn't any better than printed materials or the usual care women got from their doctors. All told, about 12 percent of women in each group availed themselves of colorectal cancer screening. The results were published online by the Archives of Internal Medicine. Although the value of some screening tests is hotly debated, there is a strong consensus for colorectal screening in the right age group. Catching and removing threatening polyps reduces deaths from colorectal cancer, the second-leading cause of cancer mortality in the U.S. Most people who get screened have a colonoscopy, although the independent U.S. Preventive Services Task Force's recommendations also recognizes two less burdensome options: a test for hidden blood in the stool and sigmoidoscopy. An editorial accompanying the study says the "abysmal rate" of screening for colorectal cancer compared with screening rates for other cancers is "truly disappointing." Gastroenterologist Dr. Hemant Roy, a co-author on the editorial, tells Shots, that he's not sure researchers have a good grasp on why the screening rate is low for colorectal cancer. He calls the poor response in the latest study, which tried a logical approach to increase participation — Web-based educational materials — "flabbergastingly disappointing." "People don't want to think about colon cancer screening," says Roy, who's affiliated with NorthShore University Health System outside Chicago. Sure, colonoscopy and the preparation for the test do put people off, he concedes. It's also the case that the options for colorectal cancer screening can be a little confusing. Colonscopy is the gold standard, but the other tests can be useful, too. "What we need to do is really to make things more acceptable," he says. One possibility is offering a menu that's tailored to a person's colorectal cancer risk factors. Those include family history, smoking, obesity and diabetes. Awareness campaigns could help, Roy says, citing TV news' Katie Couric's work. Lest we forget, Dr. Thomas Frieden, head of the CDC, got into the act 2011, publicizing the results of his own colonoscopy, which found four polyps that were removed.